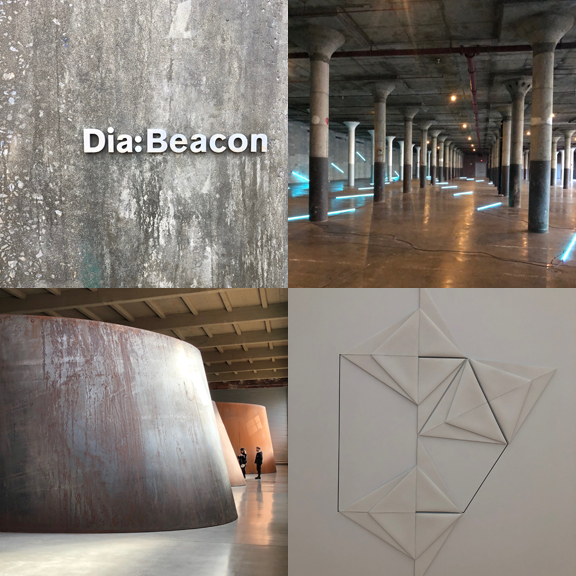 YOUR DAY AT DIA:BEACON: All you have to do is show up and enjoy! After a relaxing bus ride, we begin our day at Dia:Beacon with unstructured time from 11:00 am to 1:30 pm… time to wander through the vast space of this natural light museum, a repurposed Nabisco box printing factory turned into the Riggio Galleries, housing the Dia Foundation collection… time to take in the art work and installations of Dan Flavin, Richard Serra, Robert Smithson, Sol LeWitt, Donald Judd, Louise Bourgeois, Dorothea Rockborne, and many more; time to peruse the extensive selection of publications in the bookstore… and time to have a delicious bite to eat in the cafe. At 1:30 pm, we meet for a one-hour guided tour with a Dia trained tour guide, to hear the guide’s highlights and ask any questions we have from our earlier explorations. Winding our way back to the entry after the tour, the bus leaves at 3:00 pm to take us to the town of Beacon where we have time to take in the shops, visit the brewery or have a glass of wine at one of the local restaurants. The bus leaves Beacon at 5:00 pm to take us home.